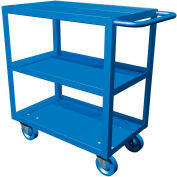 3" deep shelves move tall heavy cargo; helps prevent items from falling during transport. 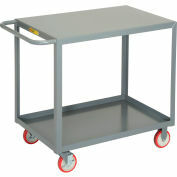 All welded 12-gauge steel shelves and curved, tubular steel handle. 2 swivel, 2 rigid 5" x 1-1/4" polyurethane casters. 35"H overall. 22" shelf clearance. Durable powder coat finish. Your review: Great cart. Used for heavy electric griddle brought into church kitchen when used -- easily moved and stored, very stable at all times. Your review: These carts are very well built. We were expecting to have to assemble them and were pleasantly surprised when they arrived fully assembled of single welded construction. 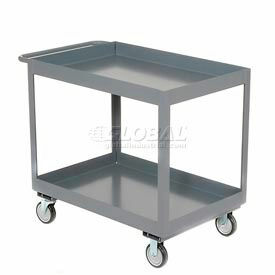 The metal is a heavy weight steel that is very durable. These carts should last many years even on our construction sites. 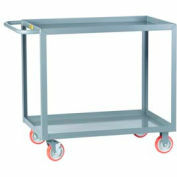 If you are looking for a sturdy metal cart, this is the one to buy.